Emus are diurnal, meaning they are most active during the day. They live in pairs and are nomadic, following the rain to feed. They can walk considerable distances at a steady pace of 4.3 miles (7 kilometers) per hour covering 9 feet (270 centimeters) in a single stride. Emus are also strong swimmers. Emus are solitary creatures and although they often travel in large flocks, this is not social behavior, rather simply going where there is food. In Western Australia, emu migration runs north in summer and south in winter. In eastern and southern Australia, their wanderings are random. On extremely hot days, emus pant, meaning they open their mouths and breathe very rapidly, much like dogs, using their lungs as evaporative coolers. 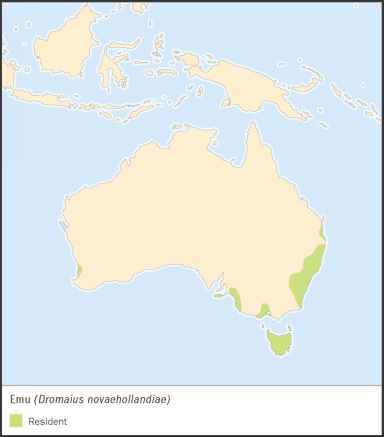 Emus have an uncanny and ill-understood way of detecting rain from several hundred miles (kilometers) away. Researchers believe this is a combination of sighting distant rain cloud formations, smelling rain, and hearing the far-off sound of thunder from distances the human ear cannot. bark, grass, twigs, and leaves in a shallow depression in the ground. In April, May, and June, the female lays large, thick-shelled dark green eggs, with one nest containing the eggs of several females. When a nest has about eight to ten eggs, the male incubates them, meaning he sits on the eggs to keep them warm until they hatch. Nests can contain fifteen to twenty eggs on occasion. 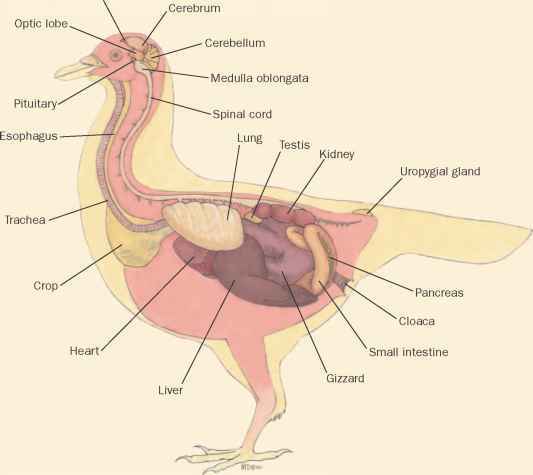 From the time the male starts incubating the eggs, he does not eat, drink, or pass bodily wastes. The male survives only on accumulated body fat. He sits on the nest twenty-four hours a day, standing about ten times a day to turn the eggs. The eggs hatch in about fifty-six to sixty days. The chicks remain with the male for five to seven months. The young reach sexual maturity at two to three years of age. The average lifespan of emus in the wild is five to ten years.